The name, type and description of a field or JSON reference are displayed in the documentation pop-up. Documentation is shown on quick navigate (Ctrl/⌘ + hover) and documentation (Ctrl/⌘ + Q) commands. Quick navigate shows a short description. Documentation shows the full description. For JSON references the referenced object’s title field is preferred as short description, while the description field is preferred as full description. For fields the OpenAPI specification documentation is displayed without the constraints (e.g. MUST, SHOULD). 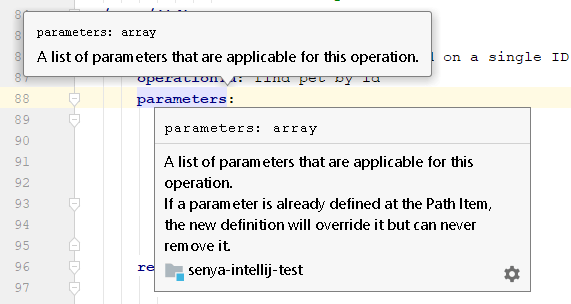 The constraints are excluded from the documentation, because those are handled by the validator. The short description is the first line of the specification documentation, which in most cases is a general description of the field. The try it out feature in Swagger UI now works. Turns out that it was a bug in JavaFX’s implementation of the Promise API that caused Swagger UI to hang when executing an API request. Swagger UI’s Promise polyfill is used instead. – JSON and XML responses are pretty printed. – Response headers are formatted as key value pairs. – The response download button is no longer available. NOTE: If the try it out feature doesn’t work for you, check if the server response includes the right CORS headers. If that doesn’t solve the problem, you can send an email or file an issue. Please include the IDE’s JRE in your message. This information can be found in the Help > About menu. Validation and completions work again in referenced files. Documentation is also available in referenced files. In version 0.19.0 context completions were introduced. An unintended side-effect of this feature was that it added path parameters for callback expressions. In version 0.20.0 this no longer happens. – Fixed JSON reference inlining bug. Thank you Mikhail for reporting this issue. – Fixed typo in Swagger examples field name (issue #748). Thanks Peter for reporting this issue.